Director – Jon Turteltaub, Screenplay – Carlo Bernard, Matt Lopez & Doug Miro, Screen Story – Lawrence Konner, Matt Lopez & Mark Rosenthal, Producer – Jerry Bruckheimer, Photography – Bojan Bazelli, Music – Trevor Rabin, Visual Effects Supervisor – John Nelson, Visual Effects – Asylum (Supervisor – Phil Brennan), Double Negative (Supervisor – Adrian De Wet), Ghost VFX, Method, One of Us & Rising Sun Pictures, Special Effects Supervisor – John Frazier, Production Design – Naomi Shohan. Production Company – Disney/Jerry Bruckheimer Films/Saturn Films/Broken Road Productions. In England, 740 A.D., the sorcerer Merlin has three apprentices, Balthazar, Horvath and Veronica. During Merlin’s fight against the sorceress Morgana-le-Fay, Horvath turns traitor and helps her kill Merlin. Veronica sacrifices herself to absorb Morgana’s soul into her own body. Baltahzar reluctantly imprisons the possessed Veronica, his love, and Horvath inside an urn known as The Grimhold. He searches the centuries for a sorcerer able to wear the Dragon Ring that will make them the one destined to defeat Morgana. In New York City in the year 2000, ten-year-old Dave Stutler wanders into the magic shop Arcana Cabana and meets Balthazar. Balthazar gives Dave the Dragon Ring to try on and is surprised when it comes to life. However, Dave accidentally drops The Grimhold and releases Horvath. Horvath and Baltahzar fight with magic and are imprisoned inside a vase as the shop burns. Ten years later and Dave has become a physics student at NYU. A lightning storm brings Balthazar and Horvath back out of the vase and Dave is caught in a battle between the two as Horvath seeks to obtain The Grimhold to free Morgana. Baltahzar takes Dave on as his apprentice and teaches him the ways of being a sorcerer. All the while, Horvath seeks to defeat them, including by manipulating Dave’s affections for his childhood sweetheart Becky. Jerry Bruckheimer is the producer best known for big and noisy action vehicles such as Top Gun (1986), Bad Boys (1995), The Rock (1996), Con Air (1997), Gone in 60 Seconds (2000) and Pearl Harbor (2001), among others. Bruckheimer was the producer who discovered and nursed Michael Bay through his first four films in what seemed a perfectly suited match for a time. In the 00s, Bruckheimer branched out from big action spectacle. He started producing in television with forensic shows such as CSI: Crime Scene Investigators (2000-15), its various spin-offs and other series like Without a Trace (2002-9) and Cold Case (2003-10). In the latter half of the decade, Bruckheimer has jumped aboard the fantasy bandwagon, discovering himself in a lucrative relationship with Disney after Pirates of the Caribbean: Curse of the Black Pearl (2003) and sequels, and other efforts like Prince of Persia: The Sands of Time (2010), The Sorcerer’s Apprentice and even a venture into the talking animals film with G-Force (2009). Bruckheimer had made sporadic genre vehicles before – Michael Bay’s Armageddon (1998), Deja Vu (2006) – but mostly these were action films before being works of science-fiction. 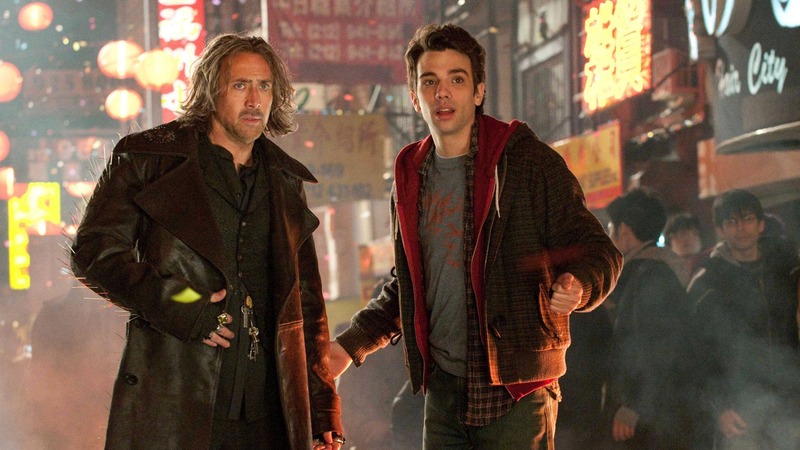 The Sorcerer’s Apprentice is another in Jerry Bruckheimer’s collaborations with Disney. In this case, Bruckheimer has brought in director Jon Turteltaub, who also made the successful Bruckheimer-produced Nicolas Cage vehicles National Treasure (2004) and National Treasure: Book of Secrets (2007). Elsewhere, Turteltaub started out making light kiddie, comedy and romantic fluff such as 3 Ninjas (1992), Cool Runnings (1993) and While You Were Sleeping (1995), which were of modest success. Turteltaub ventured into genre material with Phenomenon (1996) with John Travolta gaining a supermind, Instinct (1999) with Anthony Hopkins as a killer anthropologist, the Disney film The Kid (2000) where Bruce Willis meets his boyhood self and the killer shark film The Meg (2018), as well as producing the post-holocaust tv series Jericho (2006-8) and the horror series Harper’s Island (2009-10). A few years ago, Disney started a process of remaking some of its animated classics in live-action with the likes of The Jungle Book (1994) and 101 Dalmatians (1996). The Sorcerer’s Apprentice falls into this fad somewhat and has been construed as a cinematic expansion of the Sorcerer’s Apprentice segment in Fantasia (1940) – the one where young sorcerer’s apprentice Mickey Mouse magically animates several brooms to help with the cleaning up, only for them to go out of control. The sequence from Fantasia is dutifully replicated in live-action here with Jay Baruchel animating an army of mops that predictably go amok. Alas, all that we have is initially the mild cuteness of seeing the sequence conducted in live-action and then the prompt realisation that it is only another in the film’s array of pretty but meaningless displays of special effects. It is a hard guess to say if this represents a sad lack of original ideas in Hollywood or else the ends that people are prepared to go to clutch at something that has even the remotest recognition factor for an audience, but it feels lame. (If someone was going to make a film out segments of Fantasia, I would far rather have seen a feature-length expansion of the climactic Night on Bald Mountain sequence). Throughout the 1990s and 00s, Disney gave all appearance of taking a very large crap on their classic heritage both through an endless series of cheap sequels to their animated films and various lacklustre resurrections of their live-action films. Fantasia, their greatest animated film, gets off none the lesser here. The original The Sorcerer’s Apprentice segment was a classic tale of hubris that swam beautifully between the epical and the tiny; on the other hand, The Sorcerer’s Apprentice film has been construed almost entirely in terms of the provision of pop-up effects. These occur at regular intervals – numerous balls of fire and electricity routinely flung about, occult symbols that flame in most colours of the rainbow at different points, a Chinese festival dragon brought to life as a real dragon, various shapeshiftings, Nicolas Cage flying about on the back of a giant iron gargoyle, a car chase that takes place with one of the cars trapped inside a mirror, packs of wolves brought to life out of a poster, people materialising from hordes of maggots or clouds of ash and so on. Clearly, Jerry Bruckheimer and Jon Turteltaub have construed The Sorcerer’s Apprentice as an action movie but with magic in lieu of guns and car chases. It is rare that one has seen a film that has been so written to formula and where every element present seems to cruise by on autopilot. The special effects are interspersed with a requisite dash of romance, humour and wry one-liners, a routine world-threatening plot, and cliche scenes where we think the hero sorcerer has been killed or where the young apprentice is rendered powerless and must continue on without his magic and so on. There are also a number of credibility puncturing asides with Nicolas Cage jumping in to say “Kidding” or Toby Kebbell tossing off one-liners about “These are not the droids you are looking for” as Alfred Molina does a mind control trick. It is precisely what you would get if the Harry Potter franchise had been Americanised (as some people were originally wanting to do until J.K. Rowling put her foot down). Despite the considerable amount of special effects flourish brought to bear on The Sorcerer’s Apprentice, there is nothing in the film that does not pass by as pretty eye-candy that is forgotten the moment each individual scene ends. The special effects team create the impossible with routine regard but rarely do they create the very thing the film is supposedly all about – magic. 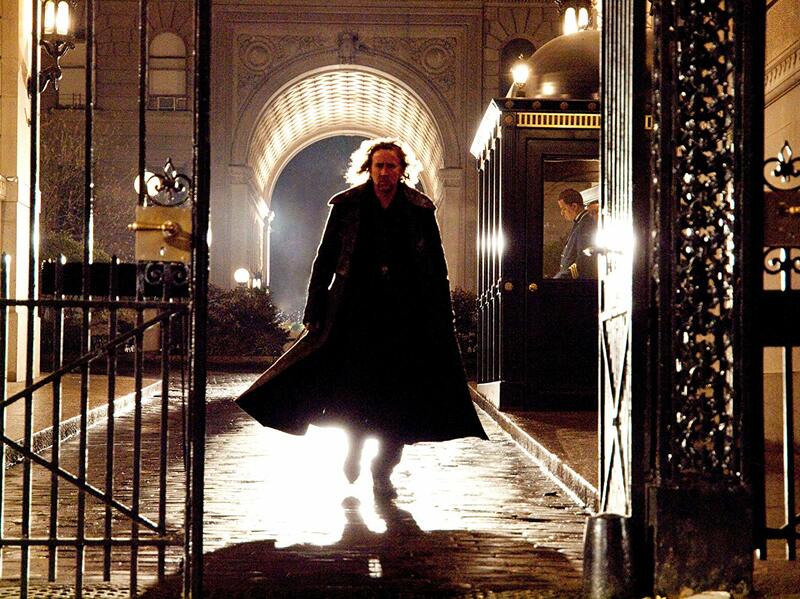 Any film that casts prime bad actor Nicolas Cage as a wise sorcerer who has remained alive through the ages has a major credibility problem from the outset. You only scratch your head and wonder why Bruckheimer and Turteltaub had to go with Nicolas Cage, an actor known mostly for appearing in bad big-budget films and denoting intensity by acting crazy, than an actor that could have inflated the role with the gravitas it desperately needs – someone like an Ian McKellan, an Anthony Hopkins, a Morgan Freeman or a James Earl Jones. The young and rising Jay Baruchel is adequate, although there is often an ingratiating over-assurance to his performance. Alfred Molina and Alice Krige, both seasoned actors, get little to do other than enact one-dimensional roles. The worst performance comes from the rising young British star Toby Kebbell, who seems determined to channel Russell Brand at the same time as playing with a thoroughly ripe British Villain’s Accent.